Headaches are one of the most common health complaints doesn’t make them any less annoying or easier to ignore. Many people try over-the-counter remedies to no avail or want to find a quick, easy solution that doesn’t require a trip to the pharmacy. This list of the top 12 best home remedies for headaches is easy to make and use, work well to provide the necessary relief, and use ingredients that many people already have at home. They’re a great way to save money and know exactly what is going into your body. The health benefits of ginger when it comes to digestion and nausea are well-known, but did you know that it’s also one of the best home remedies for headaches and migraines? Nutrition Facts has a great article about the various properties of ginger. A simple ginger tea has an anti-inflammatory effect, calming down blood vessels and providing pain relief. For best results, fresh ginger is preferred over packaged ginger teas. 1.5-2 inch piece of ginger, peeled and grated (2 tbsp. grated). Mix grated ginger into water, bring to a boil and boil for 10-15 minutes. Add lemon and honey for taste. Sip slowly rather than gulping to give the ginger time to absorb into the bloodstream. In addition to its pleasant smell and flavor, peppermint oil has menthol. Menthol has been shown to reduce swollen blood vessels, lessening the pressure in the head and providing relief for headaches. For sinus headaches, a peppermint oil steam treatment will not only reduce pain but clear blocked nasal passages, resulting in a double dose of relief. 6-8 drops of peppermint oil. Add peppermint oil to water, inhale the steam for several minutes with a towel draped over head and pot to trap in the steam. Water/peppermint oil combination may be kept up to two days for additional treatments. it can also be used with other home remedies for headaches on this list. Rosemary contains an acid with anti-inflammatory principles similar to those found in ginger. That, combined with its pleasant, soothing fragrance make it an ideal remedy for headaches caused by stress. There are a couple of ways to harness the healing powers of rosemary, including using rosemary oil or preparing a simple tea. For those with high blood pressure, it’s best to consult a doctor before using rosemary oil. Mix rosemary oil into olive oil, massage into forehead and temples. Use gentle but firm pressure and rub in slow, circular motions. Sharp movements and too much pressure may make pain worse. 2 tsp. crushed rosemary (preferably fresh). Bring rosemary and water to a boil, let boil 5 minutes then cover and steep for an additional 10 minutes. Let tea cool to room temperature before drinking, then sip in half-cup increments throughout the day. As far as home remedies for headaches go, apple cider vinegar is one of the most versatile cures. In addition to cramps, sore throat and a host of other ailments, it’s great for reducing the pain of a headache. To keep the acid-alkaline balance of a body in check, many people choose to sip a cup of water with a couple teaspoons of vinegar mixed in daily. However, for the most potent, immediate relief for a headache, a steam treatment is best. Bring water and vinegar to a boil, and then remove from heat. Drape a towel over your head and the edge of the pot. Inhale the steam vapors for several minutes, or until you begin to feel relief. The use of hot and cold temperatures to regulate a body’s response to pain is well-documented. According to an article on the National Headache Foundation’s website, hot compresses tend to work best for tension or muscle-related headaches, while cold compresses provide more relief for stress-related pain or migraines. It is best to exercise caution, however, and alternate compresses. Never leave a cold compress on longer than 15 minutes at a time, and be careful that the hot compress is not hot enough to cause burns. For a cold compress, soak a cloth in cold water, wring it out and place in the refrigerator or freezer for 30 minutes. Place on afflicted areas and let rest. Alternatively, use a commercial ice pack. For a hot compress, soak the cloth in hot water and follow the same procedure. A heating pad may be substituted, but be sure to turn it off after 15 minutes to prevent burns. Feverfew has been used for treating pain and illness for millennia, and for good reason. It has been shown to help reduce pain from arthritis, menstrual cramps, and headaches. A recent study from the University of Maryland’s Medical Center says that feverfew supplements are great home remedies for headaches, being able to even treat migraines if taken regularly. For less severe headaches, a simple tea brewed from the herb is also efficient at providing relief. 2 tbsp. crushed, dried feverfew. Boil the feverfew in the water for 5 minutes and then turn off heat. Cover pot and let steep for an additional 10 minutes. Feverfew has a bitter taste, so many people prefer to sweeten it with a dash of honey. Do not give feverfew to children under the age of 2. Besides smelling heavenly, lavender is quite good for dispelling stress headaches. It is important that you never ingest lavender oil, but the healing powers can be accessed by rubbing the oil on the temples or forehead, or by breathing in steam. You can also put a few drops of lavender oil on a handkerchief to inhale. Mix oils together, then use your fingers to slowly and gently rub into forehead and temples, using small circular motions. Inhale deeply while massaging for a calming treatment that will make stress and associated pain dissipate. Alternatively, add 6-8 drops to 2 cups boiling water for a vapor treatment that will work just as well. Besides being a fantastic addition to any pasta dish, fresh basil acts as a natural muscle relaxant, making it one of the top home remedies for headaches caused by tense muscles. Chewing fresh basil leaves will give the most immediate, potent relief, but for those who dislike the taste or don’t have access to fresh basil, dried basil steeped in tea will also work. Pregnant/nursing women should avoid large amounts of fresh basil, as it may irritate mucous glands in the stomach and intestines. ½ cup fresh basil leaves, or 2 tbsp. dried basil. Bring ingredients to a boil for 3-5 minutes and then remove from heat. Let steep 20 minutes, covered, for maximum potency. Sip slowly. 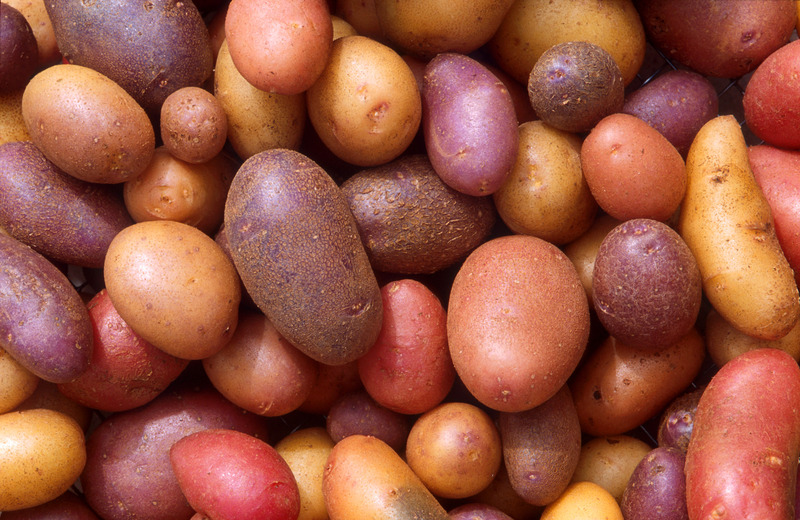 The high amount of carbohydrates in an average potato can raise a person’s serotonin levels enough to ward off pain caused by tension headaches. Be aware, however, that these effects can be negated by too much fat and protein, so it’s best to eat a whole, cooked potato all by itself. It might not be the most appetizing meal, but according to Time, a plain baked potato is one of the cheapest, easiest home remedies for headaches brought on by tension and low serotonin levels. Preheat oven to 425 degrees. Cut a line in the top of the potato. Rub all over with olive oil, then wrap in aluminum foil, ensuring the whole potato is covered. Bake for 45-55 minutes, or until tender when poked with a fork. The most common cause of headaches is dehydration. In fact, many people who drink a lot of sugary drinks or highly caffeinated drinks tend to constantly be mildly dehydrated, leading to fatigue, headache, and sore muscles. If you find that the majority of home remedies for headaches do nothing for yours, it may be that you simply need to drink more water. If you feel that you are improperly hydrated, it may be tempting to gulp down massive quantities of water in a short amount of time. However, it’s far more efficacious to sip water slowly. Too much too soon will result in your body’s not absorbing enough water. Cold or hot, it really doesn’t matter. Just be sure to drink water throughout the day to get rid of the annoying pain. Besides being a tasty snack high in fiber and healthy fats, almonds contain a high amount of Vitamin E, a natural vasodilator. According to nutritionist Ian Marber, tossing back a few almonds at the outset of a headache can reduce inflamed blood vessels and increase circulation to the head, neck, and shoulders. This, in turn, allows blood to flow more freely and reduces pain consistent with tension headaches. Whenever a tension headache flares up, slowly chew and swallow a small handful of almonds. Be sure to properly chew to allow for greatest vitamin absorption. For headaches that come from tense muscles or feelings of stress, a warm, relaxing bath is perfect. While a bath itself may provide the relaxation necessary to relieve a headache, adding a few drops of essential oils will help speed up the process. However, essential oils may contain very powerful active ingredients, so pregnant women should talk to their doctor before using them. Essential oils of choice: sage, chamomile or lavender, 6-8 drops each. Depending on the result you’re looking for, use different oils. Sage oil will lower blood pressure and relieve tense muscles. Chamomile is a natural muscle relaxant that also has anti-inflammatory properties. Lavender is a natural pain reliever and acts fast to relieve stress. Add 6-8 drops of your preferred oil into warm bathwater and soak as long as you like. To summarize, home remedies for headaches are varied and work for different types of headaches. It’s best to be aware of the cause of pain, so that the best course of treatment may be chosen. However, for common headaches brought on by stress or tight muscles, it’s likely you have the required ingredients for a remedy right in your own kitchen. Do you have a favorite home remedy for headaches? Tell us all about it in the comments section!